... and then hustled off to Stanton Station where I was able to photograph it once again. By that time and after being out in the hot sun waiting for this train, that heat exchanger's appearance reminded me of an over-sized beer keg. A cold brew was something that would have tasted good right about then to quench my thirst and toast a successful day of being trackside. 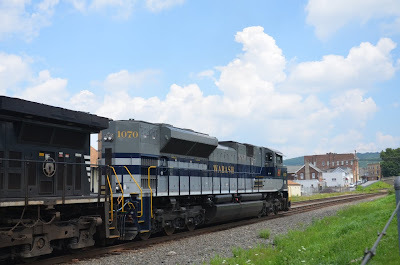 Received a heads-up about a special shipment train scheduled to operate over the Lehigh Valley Line (NS) from Bethlehem, PA to Manville, NJ on Saturday, 7-27-13. Because of this special, NS expects that their train 211-27 (Croxton to Greensboro & Atlanta) will be delayed 4 hours and 30 minutes to allow this train to pass. 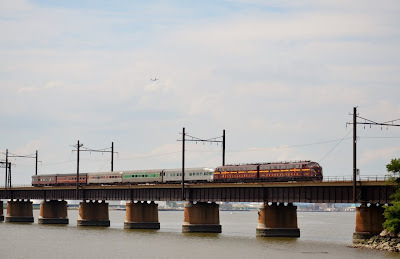 Don't know the exact schedule for 211, but it usually passes (westbound) through the Three Bridges, NJ area late Saturday morning to early afternoon. Received the following photo via email from Jim Homoki. These are the E8s pulling the AARS special heading east on the Lehigh Valley Line at South Avenue in Middlesex, NJ on 7-21-13. Also see our postings below about this special excursion train. Received the following flyer and press release via email. Note: Click on the flyer to see it full size. Then use your browser's BACK button to return here. Railroad historian, John Kilbride, will present an illustrated lecture on the historical significance of the railroad in our area as well as the story of the John Bull locomotive. Topics to be discussed will include: construction of the Camden & Amboy Railroad; operations on the C & A; the Pemberton & Hightstown Railroad, early insights into railroad travel and Hightstown views. 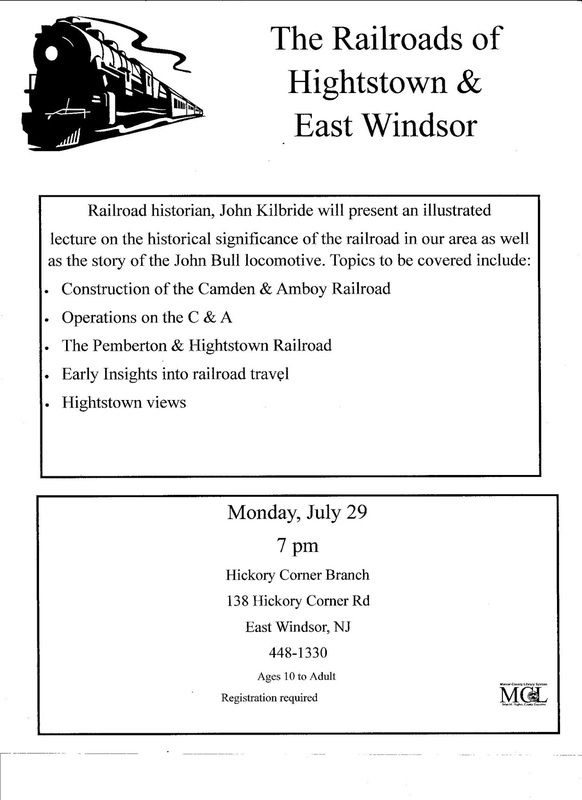 Kilbride is currently president of the Camden & Amboy Railroad Historical Group, John has been studying local railroads since moving to East Windsor in 1979. A retired railroader, John has used the rails to travel throughout the United States. Historical research and writing remain his strong interests on a variety of railroad themes. 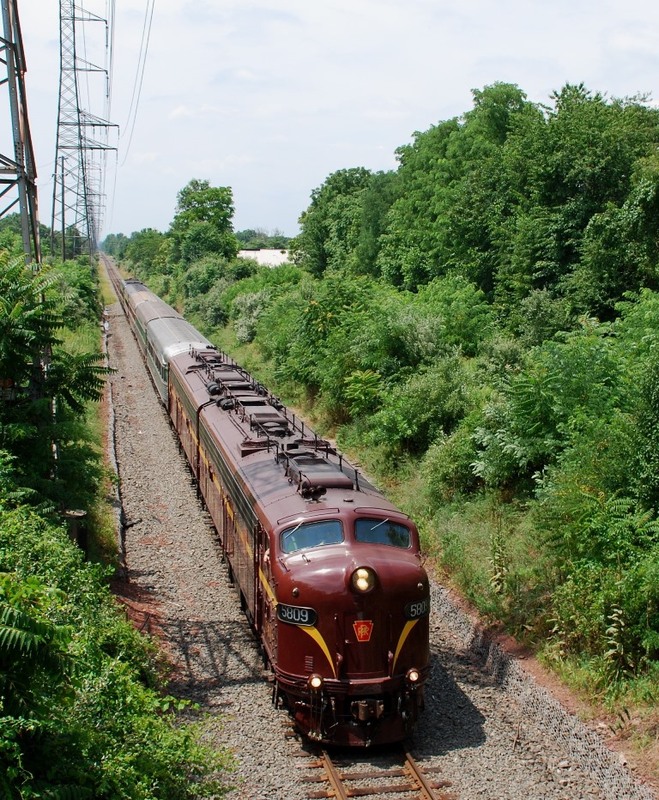 Current projects include assisting a film maker to develop documentary on the Stevens family, drafting a proposal for a historical marker to commemorate the 1901 wreck of the “Nellie Bly” passenger train (near Bordentown) and completing an index of C&A topics from various present-day publications. Registration required. Call the library at 448-1330 or register online at www.mcl.org. Steam Operating This Weekend on the Black River & Western Railroad! 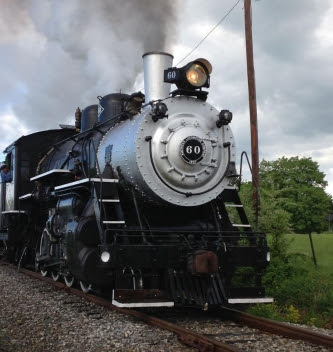 Steam locomotive #60 will be operating this weekend July 27 - 28. #60 will be the motive power for our regularly scheduled Summer Excursions AND our Saturday evening Caboose Hop train! Summer Excursion round-trips depart Flemington Station at 11:30 AM, 1:00 PM, and 2:30 PM on Saturday and Sunday. Tickets are first-come-first-serve. Reservations are not available. Children under age 3 ride FREE. Children ages 3-11 are $7. Passengers age 12+ are $14. The Caboose Hop train departs Ringoes Station at 6:00 PM on Saturday only. Tickets are by reservation only, and are now available for sale through our website. This is the last caboose train of 2013 and space is limited - purchase your tickets today! Click Here for Additional details on the Caboose Hop! Saturday June 1, 2013 to Sunday August 25, 2013 The Stationary Charter package includes exclusive use of our club car "John L Bishop" for your party of up to 40 people from 2:00 PM until 4:15 PM. The car will be parked on a sidetrack at Ringoes Station, so you will have convenient access to restroom facilities. This package includes five guest passes for a round-trip ride to Flemington and return. Additional tickets may be purchased at Ringoes Station. This historic train car is not air-conditioned. For additional information please contact charters@flemingtontrain.org. Important: This package does not include a train ride for your entire party. NORFOLK, VA. – Norfolk Southern Corporation announced that its Board of Directors today voted to increase the regular quarterly dividend on the company’s common stock by 4 percent, or 2 cents per share, from 50 to 52 cents per share. The increased dividend is payable on Sept. 10 to stockholders of record on Aug. 2. Since its inception in 1982, Norfolk Southern has paid dividends on its common stock for 124 consecutive quarters. · Railway operating revenues were $2.8 billion. · Income from railway operations was $836 million. · Net income was $465 million. · Diluted earnings per share were $1.46. · Railway operating ratio was 70.2 percent. NORFOLK, VA. – For the second quarter of 2013, Norfolk Southern reported net income of $465 million, 11 percent lower than $524 million for second-quarter 2012. Diluted earnings per share were $1.46, down 9 percent compared with $1.60 per diluted share in the same period last year. Railway operating revenues were $2.8 billion, 3 percent lower compared with second-quarter 2012, with shipment volumes increasing 2 percent. Second-quarter 2013 fuel surcharge revenues were $306 million, or $59 million less than the same period last year. General merchandise revenues were $1.6 billion, 2 percent higher compared with the second quarter of 2012, driven by increased chemical and automotive shipments. Coal revenues were $626 million, 17 percent lower compared with the same quarter last year, due to lower average revenue per unit and a 4 percent decline in volumes, the result of a combination of reduced global demand for U.S. coal and competition from natural gas. Intermodal revenues increased 4 percent to $588 million compared with the same period of 2012. Volumes increased 5 percent due to continued domestic and international growth. Railway operating expenses were $2.0 billion, 1 percent higher compared with second-quarter 2012. Income from railway operations for the second quarter was $836 million, 10 percent lower compared with the same period last year. The second-quarter railway operating ratio was 70.2 percent, 4 percent higher compared with 2012. 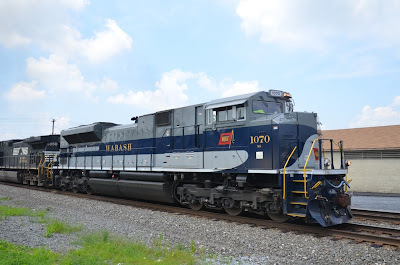 Today, 7-21-2013 Sunday, the American Association of Railroad Superintendents ran a chartered train around Conrail- Shared Assets trackage. 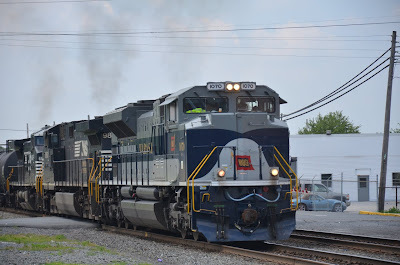 This train was operated by Conrail, Amtrak, and Juniata Terminal, the owner of these fine steads. Train left Newark, NJ Penn Station at noon, ran the Lehigh Line to Port Reading Jct, reversed ends and proceeded down the Port Reading Secondary, then up the Chemical Coast line to Oak Island. 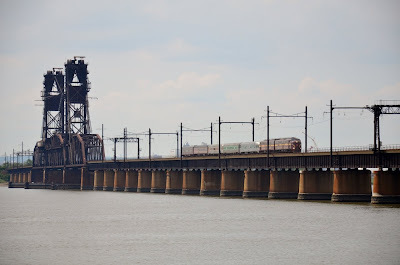 Crossed Newark Bay at Upper Draw and proceeded up the National Docks, through the Bergan Tunnels, and back on the P&H to CP NK where they proceeded to back down the NJT connection to Amtrak and returned to Penn Station. And they did it all in less than the scheduled time of 4 hours!! As usual, Mr. Levin's E-units looked and sounded good at all locations! 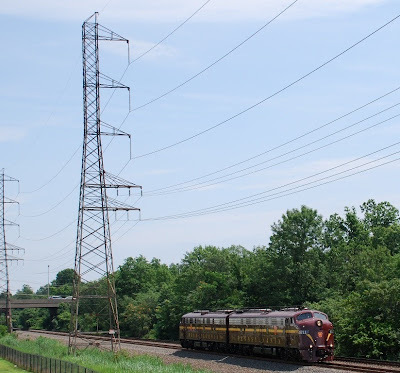 This July 21st trip departed from Newark’s Penn Station at noon and proceeded over Amtrak's Northeast Corridor to Hunter Interlocking where it diverges onto the Conrail Lehigh Line to Port Reading Junction in Manville, NJ. This excursion continued east over the Port Reading Secondary Track to Port Reading, will proceed to the "Chemical Coast" through the Oak Island Terminal and cross the Upper Newark Bay to the National Docks Branch with clear views of New York skyline and Statue of Liberty. 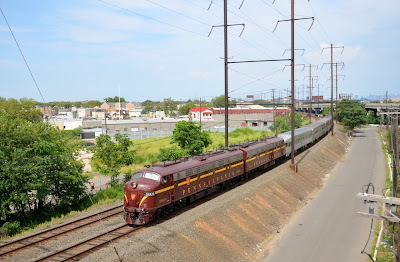 After passing through the recently enlarged Bergen Tunnel, the train will be at Croxton and enter the Northern Branch, cross the Hack movable bridge and run the former PRR Passaic & Harsimus branch back to Newark. Power for the train will be Juniata Terminal Company's restored PRR E8 locomotives 5711 & 5809 as well as business cars Pennsylvania 120 and Warrior Ridge. The Morristown & Erie Railroad will also provide business cars from their fleet for this train. The trip is being operated by Amtrak & Conrail for the benefit of the American Association of Railroad Superintendents during their 117th annual meeting held in Newark, NJ. Image 1: Shows the two E8s heading to Manville on track 1 minus their five car consist. Those cars were uncoupled from the E8s just west of the Bound Brook station. At Manville the E8s would switch over to track 2, head east and couple back up to the coaches for the trip over the Port Reading Secondary. Image 2: Rolling down the Port Reading Secondary, the special is about to pass beneath the Old New brunswick Road overpass in Middlesex, NJ. NORFOLK, VA. – Communities, customers, and other stakeholders served by Norfolk Southern have benefited from the steady progress the railroad made in 2012 toward achieving its goals in corporate sustainability. The railroad’s gains include reducing emissions of greenhouse gases and advancing its Trees and Trains tree-planting initiative. Norfolk Southern highlights these and other activities in its 2013 sustainability report, “Connections,” released today on the company’s environmental website, www.nssustainability.com. The sixth annual report highlights Norfolk Southern’s commitment to best practices of corporate environmental, economic, and social responsibility. The exclusively online report is more interactive and user friendly than previous reports, featuring a Report Builder function and greater access on handheld tablet devices. In addition to environmental progress, the report documents how the company is contributing to the economic and social vitality of communities in the eastern U.S. through support of business development, charitable giving, employee volunteerism, and a well-paid workforce. Norfolk Southern reduced its greenhouse gas emissions by 4 percent in 2012, reflecting ongoing efforts to improve network operating efficiencies, reduce locomotive fuel use and emissions, and lower energy usage at railroad office buildings and facilities. By year’s end in 2012, Norfolk Southern had accomplished nearly 69 percent of a 2014 goal to reduce carbon emissions by 10 percent per revenue ton-mile of freight transported. Norfolk Southern hired more than 2,400 new employees in 2012, and the railroad’s Norfolk Southern Foundation donated a record $6.98 million to local communities for human services, environmental conservation, education for children, and arts and culture. Norfolk Southern completed 40 percent of its $5.6 million Trees and Trains carbon-mitigation initiative to reforest 10,000 acres in the Mississippi Alluvial Valley. Since its launch two years ago, Norfolk Southern has expanded efforts to help restore longleaf pines and American chestnut trees to their historic Southeastern U.S. ranges. 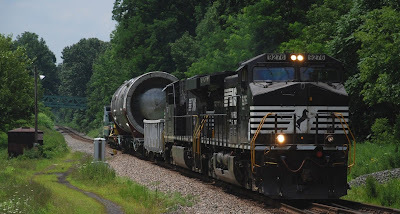 Norfolk Southern has equipped more than 70 percent of the railroad’s locomotives with idle-reduction technology, and more than half of its long-haul locomotives have computer-based technologies installed to help engineers achieve maximum fuel economy. Diesel-burning locomotives generate around 90 percent of Norfolk Southern’s annual greenhouse gas emissions, and the railroad has a range of strategic initiatives in place to improve fuel- and network efficiencies. The report also features “Sustainability in Action” profiles on employees who have helped Norfolk Southern accomplish sustainability successes in the workplace and in communities the railroad serves throughout its 22-state network. 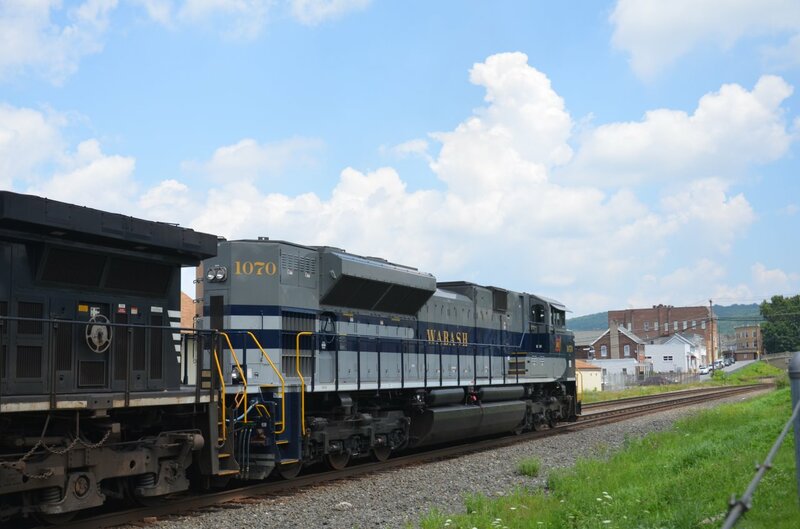 NS has completed $22.6 million in improvements to major coal line through Pennsylvania’s Monongahela Valley. NORFOLK, VA. – Norfolk Southern has completed $22.6 million in track, bridge, and signal improvements along its major coal line through Pennsylvania’s Monongahela Valley. Relatedly, NS crews also installed new signals in West Brownsville, Pa., the first step in expanding the rail yard there so that 130-car coal trains – an industry standard – are handled more efficiently. The project also calls for lengthening two mainlines and two yard lines so NS can efficiently stage 130-car coal trains. The yard also is a crew change point. Received the following via email from the Black River and Western Railroad. Back by popular demand for 2013, the Readin' Railroad Story Time train will depart Flemington Station at 9:00 AM on Saturday, August 10. Reservations are required, and tickets are now available for sale on our website. Enjoy a round-trip excursion between Flemington and Ringoes, and the Conductor will narrate a popular children's book. Kids can follow along with their own copy of the book! Don't forget that we still have tickets available for our Saturday night caboose hops, operating every Saturday in July. Saturday August 10, 2013 Enjoy a round-trip excursion between Flemington and Ringoes, and the Conductor will narrate a popular children's book. Kids can follow along with their own complimentary copy of the book! Reservations required. "A" tickets are Adult tickets (age 12+). "C" tickets are Child tickets (under age 12). Make sure you consider how many books you want when choosing which tickets to purchase. Only tickets that indicate "1 book" in their description include a book! JACKSONVILLE, Fla. - July 16, 2013 - CSX Corporation (NYSE: CSX) today announced second-quarter net earnings of $535 million, or $0.52 per share, versus $512 million, or $0.49 per share, in the same period last year. This performance was supported by overall revenue growth; service and efficiency results; and a few additional items, such as tax and real estate, which benefitted the quarter. "CSX continues to drive solid growth in many of its markets and is encouraged by the team's sustained track record of delivering excellent operating performance in a wide range of market conditions," said Michael J. Ward, chairman, president and chief executive officer. "We remain sharply focused on creating strong, sustained value for customers and shareholders, as the economy appears to be slowly gaining strength." Second-quarter revenue was nearly $3.1 billion, a slight increase from the same quarter last year, as strong service resulted in overall increases in volume and pricing. The higher revenues along with efficiency gains helped to deliver second quarter operating income of $963 million and an operating ratio of 68.6 percent. CSX remains on track to achieve its goal of sustaining a high-60s operating ratio by 2015, while remaining focused on attaining a mid-60s operating ratio longer-term. The company continues to expect annual earnings-per-share growth of 10 to 15 percent on average through 2015 off of the 2013 base, which is now expected to be roughly flat compared to prior year levels. CSX executives will conduct a quarterly earnings conference call with the investment community on July 17, 2013, at 8:30 a.m. Eastern time. Investors, media and the public may listen to the conference call by dialing 1-888-EARN-CSX (888-327-6279) and asking for the CSX earnings call. Callers outside the U.S., dial 1-773-756-0199. Participants should dial in 10 minutes prior to the call. In conjunction with the call, a live webcast will be accessible and presentation materials will be posted on the company's website at http://investors.csx.com. Following the earnings call, an internet replay of the presentation will be archived on the company website. JACKSONVILLE, Fla. - July 10, 2013 - Earlier today, the board of directors of CSX Corporation (NYSE: CSX) approved a $0.15 per share quarterly dividend on the company's common stock. The dividend is payable on September 13, 2013, to shareholders of record at the close of business on August 30, 2013. Also see our post below about NS and the 'Hiring Our Heroes' event. Thanks to John Kilbride for a heads-up on this photo. 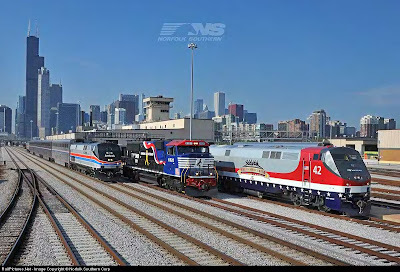 NORFOLK, VA. – Norfolk Southern will participate in a “Hiring Our Heroes” fair with the U.S. Chamber of Commerce Foundation to help veterans and military spouses seek employment opportunities in the rail industry. The free hiring fair will be from 10 a.m. to 1 p.m., Wednesday, July 10, at Chicago Union Station, 500 W. Jackson Blvd. A dozen employers and some 115 prospective employees will be in attendance. Veterans locomotives from Norfolk Southern and Amtrak will be staged at the event to honor attendees. NS and other representatives will be on site to discuss job opportunities. Over the past six years, Norfolk Southern has hired some 1,300 veterans, and today 14 percent of the total NS workforce – more than 4,200 employees – are veterans and members of the National Guard and Reserves. Hiring Our Heroes fairs are designed to help veterans and their families find employment opportunities in the fastest growing markets and industries. There have been more than 530 hiring fairs throughout the United States, Puerto Rico, and the District of Columbia. In 2012, more than 18,400 veterans and military spouses obtained jobs through this program. For more information, visit www.uschamber.com/hiringourheroes. NS job opportunities can be found on the website at http://www.nscorp.com/nscportal/nscorp/Job_Seekers/. 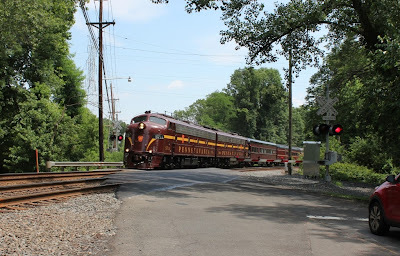 NORFOLK, VA. – Norfolk Southern and Virginia’s Natural Tunnel State Park are hosting a Railroad Day for members of the community to learn about safety near railroad tracks and facilities and to enjoy the history and beauty of the area. The event will be from 10 a.m. to 6 p.m., Saturday, July 13, at Natural Tunnel, 1420 Natural Tunnel Parkway. 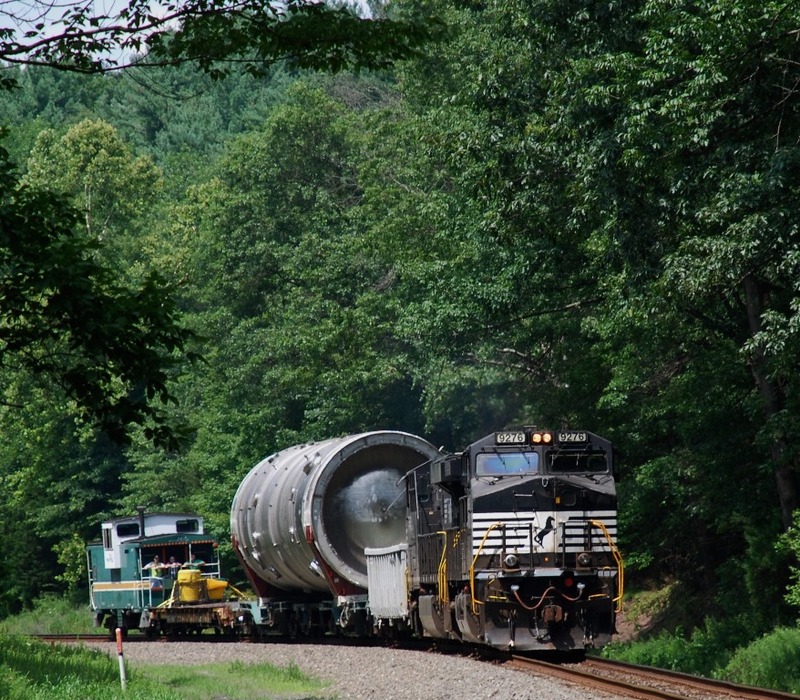 Norfolk Southern’s Virginian Railway Heritage Locomotive will be staged inside the opening of the 850-foot tunnel. Casey Thomason, NS’ acclaimed photographer, will conduct a workshop on safe, creative, and legal ways to photograph trains. Also on site will be an Operation Lifesaver unit accompanied by a volunteer who will discuss highway-rail safety and trespasser awareness. Guests will have the opportunity to take guided tours through the tunnel from 10 a.m. to 4 p.m. Tony Scales, certified geologist and author of “Nature’s Marvel in Stone,” will discuss how the tunnel was created and how it has evolved over the years. The Natural Tunnel is part of the Appalachian Mountains located in Scott County. The Commonwealth of Virginia acquired the park in 1967 and opened it to the public in 1971. In 1890, the South Atlantic and Ohio Railroad laid the first railroad tracks through the tunnel, which later were acquired by NS’ predecessor Southern Railway. The tracks now serve as NS’ main line on the Central Division, connecting Knoxville with the coal region of Southwestern Virginia. Parking will cost $3 per vehicle, and the chairlift fee will be $3 per person. For more information about the park, visit www.virginiastateparks.gov. Received the following via email from Kermit Geary, Jr. Photos and text are his. The Bluebird (of Happiness?) 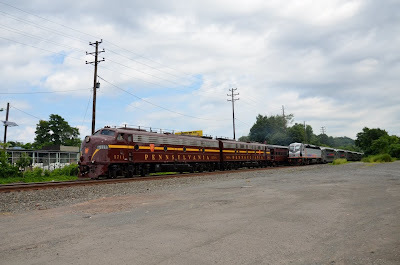 graced the NS Lehigh Line today (7-8-13), leading 16N into Allentown, PA. It was a long wait in the hot sun, only to get dinked by a cloud at the last minute...too late to move or anything like that. Oh well, it is what it is and I have notched another one on the list. Only seven more to go!!!!! Remember when Conrail's brand-new B36-7s were delivered in late 1983 with these SP-esque fabricated sheet metal side air intake 'shields'? GREENSBORO, N.C. – More than 149 local emergency responders received hands-on training in June in responding to rail-related hazardous materials incidents. BASF and Norfolk Southern Railway sponsored the training at the NS Pomona Yard in Greensboro, N.C. Both Norfolk Southern and BASF consider emergency preparedness education an essential element of responsible corporate citizenship and sustainable business growth. Greensboro, High Point, Pinecroft-Sedgefield, Southeast, and Orange Rural Fire Departments, and Guilford County Emergency Services participated. The training was provided through TRANSCAER (Transportation Community Awareness and Emergency Response), a consortium of companies from the chemical and rail industries that voluntarily assist communities in preparing for and responding to a possible hazardous material transportation incident. Emergency responders play a critical role in protecting the public's safety and security, and TRANSCAER programs bring them the information and training they need to prepare for and respond to a chemical transportation incident. BASF provided instructors and their training tank car, “Mr. T,” which is equipped with multiple domes on top to allow responders to understand the look and function of valves and fittings. Responders can also go inside Mr. T to view samples and cutaways of valves and to examine the underside of the top fittings. Using Mr. T, responders were trained in various aspects of rail and tank car safety and were shown how to apply handbrakes to prevent a rail car from moving in the event of an accident. They also were briefed on the dangers involved with emergency equipment when coming up on grade crossings while responding to regular calls. Trains can operate very quietly at speeds that can be deceiving. Norfolk Southern will sponsor two other hands-on TRANSCAER training opportunities in North Carolina this year and at numerous other locations across the rail system. NS will have Dupont training cars in Spencer, N.C. on July 30, 31, and Aug. 1 and BASF will again partner with NS for training sessions in Charlotte on Aug. 6, 7, and 8. For more information email Paul.Williams2@nscorp.com. JACKSONVILLE, Fla. - July 2, 2013 - With summer activities in full swing and the Fourth of July holiday approaching, CSX Corporation (NYSE: CSX) reminds everyone to stay away from railroad tracks and motorists to use caution at grade crossings. "We hope our community neighbors enjoy their picnics, fireworks and time with family and friends, but never underestimate the dangers of trespassing or playing on railroad property," said Terry Ludban, director - community affairs and safety. "Always be alert and remember to play it safe near railroad tracks." - It can take an average freight train more than a mile to come to a complete stop. - Trains do not always operate on predictable schedules, so assume one could pass by at any moment. - Highway-rail intersections should only be crossed at designated pedestrian or roadway crossing locations. - Trains can overhang the tracks by three feet or more on each side. Standing next to the tracks is dangerous, and most bridges and tunnels only have room for trains to pass. - Tracks are private property. Walking or riding on tracks or other railroad property without the permission of the railroad is illegal. Violators will be prosecuted, and they risk the possibility of serious, even fatal, injury. "Public safety is a top priority at CSX, and we work closely with our employees, communities and industry partners on education and awareness programs designed to end collisions, fatalities and injuries at grade crossings and on railroad tracks," Ludban said. Those programs include CSX's "Play it Safe" partnership with Front Row Motorsports and NASCAR driver David Ragan, whose car bears a bumper sticker that says "I brake for trains," reminding everyone to stop at railroad crossings and obey any signs or warning signals. JACKSONVILLE, Fla. - July 1, 2013 - CSX (NYSE: CSX) employees today kicked off an eight-day maintenance marathon, designed to complete work that would normally take 18 weeks. This accelerated timeline will be accomplished by temporarily re-routing traffic on the CSX main line in portions of three southeastern states to give workers uninterrupted time for upgrades and repairs. "Thanks to our dedicated employees, we're able to complete an incredible amount of work, while minimizing disruptions to our customers, to keep rail traffic moving safely and reliably," said Oscar Munoz, executive vice president and chief operating officer. "We call it a jamboree because of the strong teamwork and camaraderie that has developed over the years during this maintenance blitz." 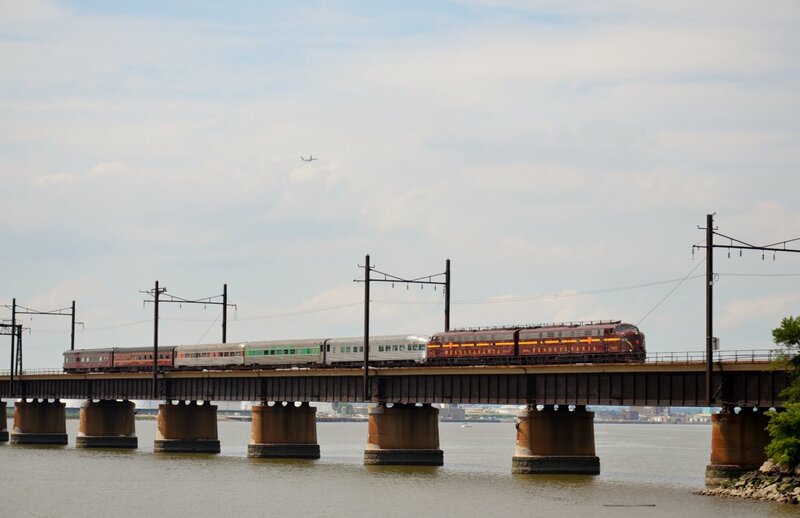 The timing of the maintenance takes advantage of historically lighter rail volume during the Fourth of July holiday week. This year the work will focus on key routes between Shelby, Ky. and Spartanburg S.C. and from Bostic to Monroe, N.C.
Nearly two-thirds of CSX's network-wide system production teams, as well as division engineering teams, signal teams and bridge forces are involved in the jamboree. Crews will replace or install more than 64,000 cross ties and 150,000 linear feet of rail, while smoothing and shaping the track roadbed and ballast over 40 track miles. Road crossings will be upgraded, and CSX has coordinated temporary closings and motor vehicle traffic re-routing, where necessary, through local government agencies. The jamboree is part of CSX's $2.3 billion capital spend for 2013, designed to help enhance the network in advance of increased demand for freight transportation services - estimated to more than double nationwide by 2040, according to the United States Department of Transportation. "The maintenance jamboree is a prime example of the investment and effort we dedicate to ensuring that the nation's critical rail transportation network is ready to safely meet the country's growing needs while providing terrific benefits to our environment and our economy," Munoz said. CSX, based in Jacksonville, Florida, is a premier transportation company. It provides rail, intermodal and rail-to-truck transload services and solutions to customers across a broad array of markets, including energy, industrial, construction, agricultural, and consumer products. For more than 185 years, CSX has played a critical role in the nation's economic expansion and industrial development. Its network connects every major metropolitan area in the eastern United States, where nearly two-thirds of the nation's population resides. It also links more than 240 short-line railroads and more than 70 ocean, river and lake ports with major population centers and small farming towns alike. More information about CSX Corporation and its subsidiaries is available at www.csx.com. Like us on Facebook(http://www.facebook.com/OfficialCSX) and follow us on Twitter (http://twitter.com/CSX).